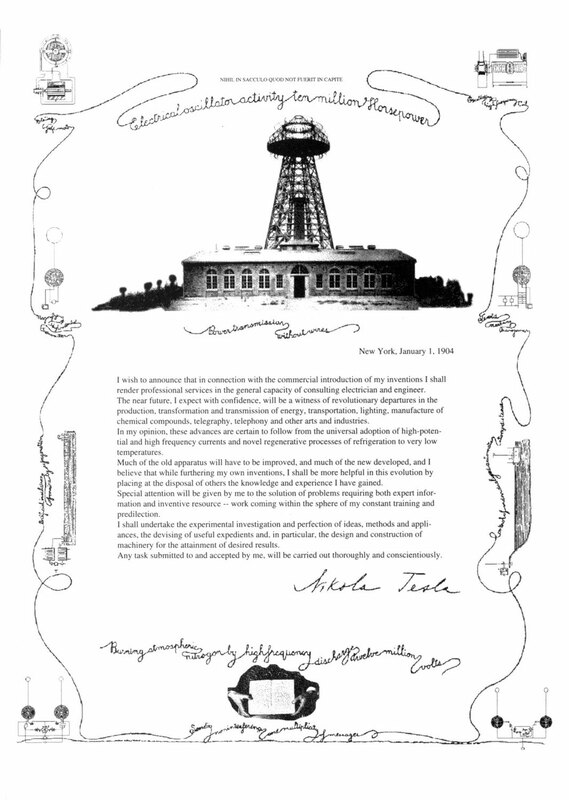 We reproduce herewith in slightly reduced facsimile the first page of a four-page circular which has been issued this week by Mr. Nikola Tesla in a large square envelope bearing a large red wax seal with the initials, “N.T.” At the back of the page, which we reproduce, is given a list of 93 patents issued in this country to Mr. Tesla. The fourth page is blank. The third page has a little vignette of Niagara Falls and is devoted to quotations from various utterances of Mr. Tesla. The first of these is from his lecture delivered in 1893 before the Franklin Institute and the National Electric Light Association, as to transmission of intelligible signals and power to any distance without the use of wires. The second quotation is from his article on "The problem of increasing human energy", which appeared in the Century Magazine in June, 1900, dealing with virtually the same subject. 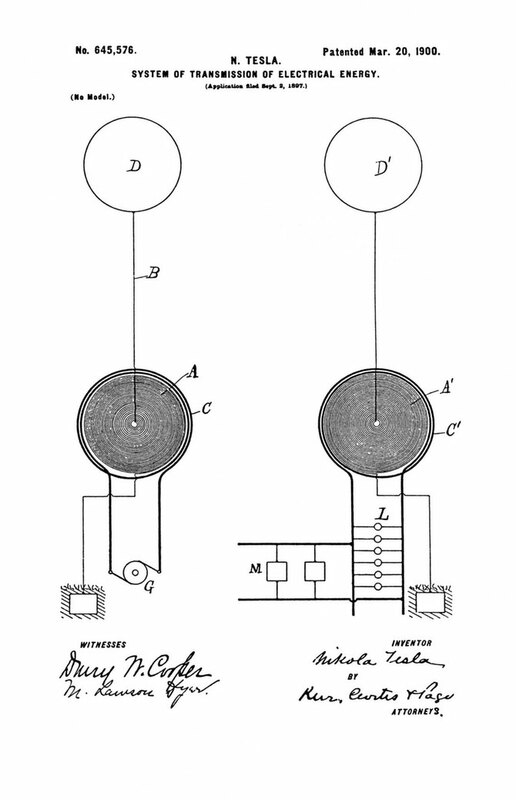 The third item quotes from his patents, US645,576 - System of Transmission of Electrical Energy , March 20, 1900 and US649,621 - Apparatus for Transmission of Electrical Energy - May 15, 1900, dealing with the transmis­sion of electrical energy in any quantity to any distance, with transmitting and receiving apparatus movable as in ships or balloons. The circular is an extremely interesting one. It is most sumptuously got up on vellum paper and altogether con­stitutes a manifesto worthy of the original genius issuing it. It is to be gather­ed from the circular that Mr. Tesla proposes to enter the field of consulting engi­neership, in which he already has enjoyed an extensive connection here and abroad. I wish to announce that in connection with the commercial introduction of my inventions I shall render professional services in the general capacity of consulting electrician and engineer. The near future, I expect with confidence, will be a witness of revolutionary departures in the production, transformation and transmission of energy, transportation, lighting, manufacture of chemical compounds, telegraphy, telephony and other arts and industries. In my opinion, these advances are certain to follow from the universal adoption of high-potential and high frequency currents and novel regenerative processes of refrigeration to very low temperatures. Much of the old apparatus will have to be improved, and much of the new developed, and I believe that while furthering my own inventions, I shall be more helpful in this evolution by placing at the disposal of others the knowledge and experience I have gained. Special attention will be given by me to the solution of problems requiring both expert information and inventive resource – work coming within the sphere of my constant trailing and predilection. I shall undertake the experimental investigation and perfection of ideas, methods and appliances, the devising of useful expedients and in particular, the design and construction of machinery for the attainment of desired results. Any task submitted to and accepted by me, will be carried out thoroughly and conscientiously. Springs Coil in white, clear graphics while it is discharging. if you first haven't thought about it carefully. Rotation is produced and maintained by direct attraction; Utilizes shifting poles; Induction magnetic motor. Cited by Tesla in "the True Wireless" (illustrated in that article as Fig. 10) in the wireless field for the concatenated tuned circuits; regulates the energy delivered by a system for the production of high-frequency currents and comprising of a supply-side circuit whose current is diverted into a charging circuit of high self-induction, a condenser (charged by the supply circuit), another circuit (with low self-induction) which the same discharges through (and raises the potential of the condenser), and means for controlling the charging and the discharging of same, the said method consisting in varying the relation of the varying frequencies of the impulses in the circuit comprise the system. An early Tesla transmitter consisting of a flat-spiral quarter-wave resonator and an elevated terminal. It was upheld in the 1943 Supreme Court decision. 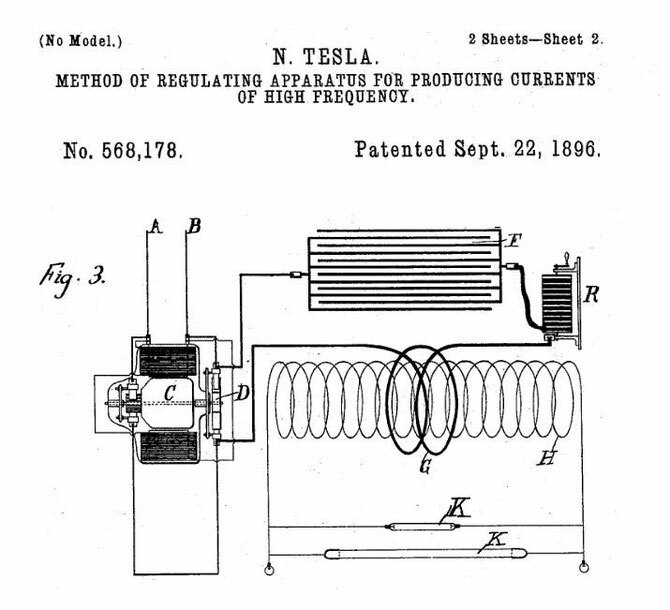 Commonly referred to as the radio patent; Related to wireless telegraphy; Wireless transmission of electric power through the natural media; Cites well known radiant energy phenomena and the experiments of William Crooke; Corrects previous errors in theory of behavior when used by the methods and means of Mr. Tesla; Discovery of highly important and useful facts which heretofore have been unknown; Deprive dialectic of air when impressing electromotive forces of a certain character and magnitude unto it; Conductivity of the air increases with the augmentation of the pressure and the rarefaction; Law of conductivity of the air is quite different from heretofore established; Illustrations of the facts. 613,809 - Method of and Apparatus for Controlling Mechanism of Moving Vessels or Vehicles - filed 1 July 1898, granted 8 Nov. 1898. Patent diagram showing Tesla’s radio-controlled boat and transmitter. S is a generator producing electromagnetic waves and is connected to an antenna. To its left is the control box - Figure 9. 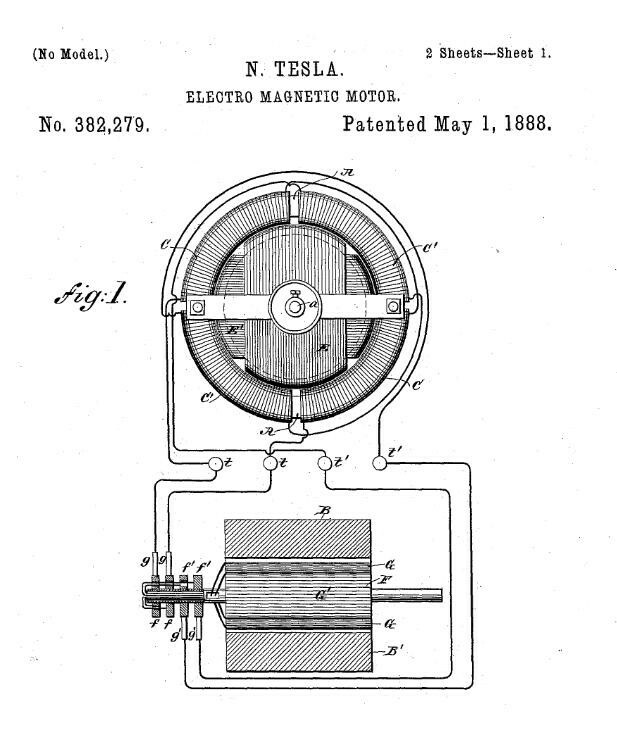 Tesla "Boat" patent; First logic gate; Art of controlling the movements and operation of a vessel or vehicle at a distance; Electromagnetic waves conveyed to vessel by the natural media and rendering by their means the controlling-circuit active or inactive; New and useful improvements in methods of and apparatus for controlling from a distance; Solution for controlling from a given point the operation of mechanisms; No intermediate wires, cables, or other form of electrical or mechanical connection with the object save the natural media in space; explanation of most practical and effectual method and apparatus; Remote control. Radio was originally patented here. Marconi patented his similar technology for communication use in 1903. Eventually the US Supreme Court acknowledged, partly on the basis of this patent, that Tesla was the first inventor of radio. The ruling was made in 1943, right after he died. It is obvious from this patent and several other contexts that Tesla did not regard radio as a good communication medium. He often wrote about universal communication systems, but they were to be set up as parts of larger universal electrical transmission systems. That's why radio was relegated to being used for remote control. Elevated transmitter capacitance; Coil; Earth electrode; Signal generator; Partial basis of radio design. One of Tesla’s patents, Method for Signaling, Patent No. 723,188, which has the two primaries marked as “p1 “and “p2”—possibly the origin of the title “p2” given to the 1935-38 New Mexico project run by von Braun—shows an oscillator system having two separate pancake-coils, tuned differently, running off a common rotary spark gap and dynamo. If one coil is tuned to one quarter wavelength, and the other to a full wavelength, they would comprise a D.C. brush circuit and a high frequency A.C. circuit, respectively. The A.C. circuit could be run at all times on the bottom and rear, with the brush being activated at the top to lift off, and to the front to go forward or turn. Elevated transmitter capacitance; Coil; Earth electrode; Signal generator; Apparatus of and method for electrical disturbance or impulses; Transmission of intelligent messages; Govern the movement of distant automata; Radio transmissions; Partial basis of radio design. Very nice and complete overview of his work upto 1904. An overview of his knowledge he wanted to share. And his intension to work for others. In later years he didn't want to put to much effort and money in his new patents. Are there traces of that. Maybe patent proposals that didn't made it to a final patent?